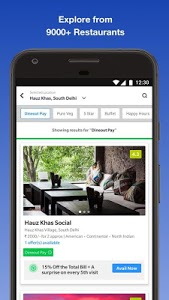 As India’s Largest restaurant reservation platform, Dineout helps more than 10 million people find new restaurants; view restaurant menus, reviews, and photos; and get great discounts of up to 50% Off or 1+1 offers on food & drinks across 9,000 restaurants in Delhi-NCR, Mumbai, Bangalore, Pune, Chennai, Hyderabad, Ahmedabad, Kolkata, Chandigarh, Goa & Jaipur. Install & reserve a table at your favourite restaurant to get great discounts today. 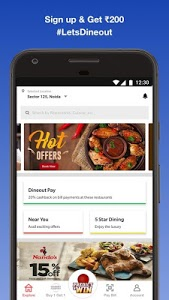 The Dineout App, helps you find a restaurant according to your mood, from romantic dinners to rooftop bars, from fine-dining and 5-star hotels to pubbing and casual dining, Dineout will spoil you for choice and help you find the best discounts. - Reserve for FREE at over 9,000 restaurants with Exclusive Discounts. - Exclusive 1+1 offers:Gourmet Passport enjoy Buy One Get One Free buffet, the main dish and drink deals at over 800 fine dining restaurants and bars across 5-star hotels and standalone chains in Delhi NCR, Mumbai, Bengaluru, Hyderabad, Pune, Ahmedabad and Kolkata. 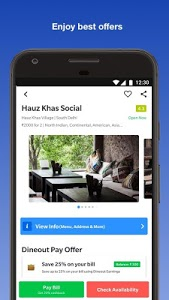 Discover new restaurants or find your favourite directly from the App and save up to Rs. 10,000 in one meal! Combine your food and drinks coupons at the same visit to save even more. 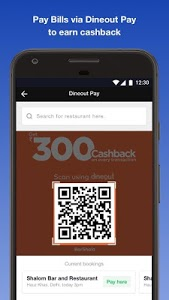 - Pay Restaurant Bill: With Dineout Pay make cash-free payments through the app to earn amazing cashbacks in addition to the Discounts which can be redeemed the next time you dine out. - Upload Bill: for extra cashback. 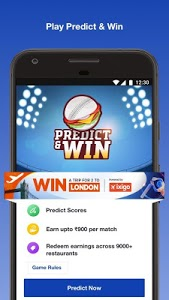 Upload your restaurant bill to Earn Cashback which can be redeemed the next time you dine out. 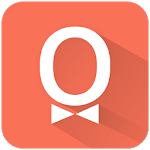 - Discover restaurants: Check out restaurants around you or find new restaurants by going through their menus, pictures, cost, offers, opening hours, reviews and more. For queries and suggestions, write to us at [email protected] or call at +91-9212340202. 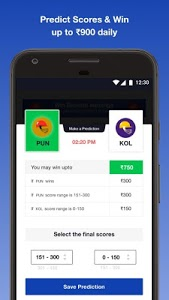 Similar to "Dineout: Restaurant Booking, Reviews & Food Deals"